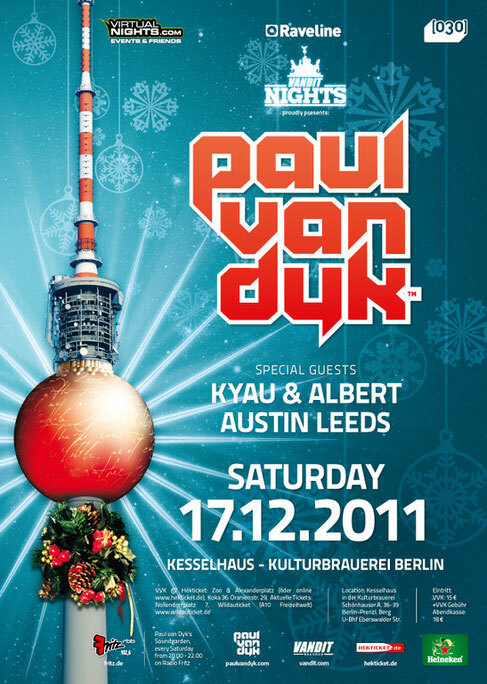 Paul van Dyk will be presenting his Winter Vandit night on Saturday 17 December at the Kesselhaus Club in Berlin. With support from neo-trance duo Kyau & Albert and electro house sensation Austin Leeds, this promises to be an amazing night for local Berliners and many more from further afield. On a night which will celebrates Paul van Dyk’s birthday. Kyau & Albert will also be celebrating their label, Euphonic’s, tenth anniversary by promising to play many of the label’s hits, including ‘Touch My Mind’ and ‘Epic Monolith’. While those familiar with the sounds of Florida based Austin Leeds can expect many of the tracks of his that have featured on the huge VONYC Sessions, including ‘Sting’, ‘Voodoo’ and ‘Get Up’. Click below to hear some of the top releases from Vandit in 2011.